I am not sure who first thought up Annual Conference, but it has been integral to the organization and culture of Methodists for a couple hundred years now. While it used to take place in the fall, it was moved some time ago to summer, and has remained there, so that the preacher’s children don’t have to change schools in the middle of the year. That wouldn’t even be a consideration in the Catholic church. Every year hundreds of Methodists gather at some assembly place in the regional conferences across the country and around the world. All clergy who are credentialed through their conference are made to report there, as well as representatives from each local church and lay leaders from each district within the conference, enough to make up an equal representation of lay and clergy. And I should be using the name United Methodist, but I’m quite a bit old fashioned in that regard. The first person in my family to attend a session of annual conference was my great, great grandfather, William Perry. He had come home from the Civil War, a broken and defeated confederate soldier (19th Tennessee Infantry), with a bullet wound in his hat. He married a lady who had gotten religion in 1857 during a revival that started the church. After he got back from the war, they began a life together and started raising a family. Their oldest son who lived (their first child died within the first year of life), became a minister in the Methodist Episcopal Church, South, and so Granddaddy Perry got actively involved in district and conference meetings, representing his church and priding himself in having contributed to the pastoral work. His brother, Uncle Cliff, represented the northern Methodist group, and went to their district and conference events. Uncle Cliff and Granddaddy Perry went to the same church. Did you see that last sentence? A southern Methodist, and confederate veteran went to church with a northern Methodist and Union Army veteran. Side by side. They sat in the same pew. Maybe I should back up a little. See, East Tennessee (which should be its own state, since it differs so much in politics from the rest of Tennessee), was fraught with divided loyalties during the “Great Upheaval.” Tennesseans aren’t real good at conformity, and although it was popular at the time to support confederate ideas, many Tennesseans sided with the north, especially East Tennesseans. So in the Perry family, Uncle Cliff went to war with the union. Grandpa went to war with the confederates. After the war they both came home (thank God) and when they married up, their wives were cousins to each other. They lived near each other, and the church in the community was their family church. It was the only church in the area. Because there were two Holston Conferences from 1865 to 1939, (one north and one south), this congregation decided to be a “union” church. That doesn’t mean they supported the union, it means they were “united” as a congregation of two entities, the ME Church and the ME Church, South. They swapped preachers each week, one week a northern conference preacher would preach, the next week a southern conference preacher would preach. Joint rolls were kept of the congregation. Sunday School literature was swapped each year. And so they lived and worshiped and related to one another as the years went by, and slowly, but surely, the two entities finally merged (along with the Methodist Protestants), and became the Methodist Church. Since that time, there’s only been one Holston Conference. And we’ve met in places across the region, from Radford, Virginia to Chattanooga, Tennessee. In the 1960s, and again in the 1970s, we started meeting at Lake Junaluska, in North Carolina. This is a large resort-like assembly ground owned by the Southeastern Jurisdiction of what is now the United Methodist Church. Every second week of June we meet for three or four days and sing the songs of faith, listen to sermons and Bible teaching, hear reports from various committees in the annual conference, take communion, memorialize the dead preachers and spouses, enact any business that needs to be acted upon, and hear where the bishop is going to send the preachers this year. It’s a full few days. And it’s like a big family reunion as we see one another and relive old times, and welcome new preachers (with ordination and licensing services), and much good will is present. I first attended Annual Conference the summer after my dad took his life. My preacher that year seemed interested in pointing me towards the ministry. It must have worked. I was impressed with the large number of people present and the great preaching. And I loved to hear Bishop Finger speak in his eloquent way with his lingering “s” at the end of his wordsssssssssss. 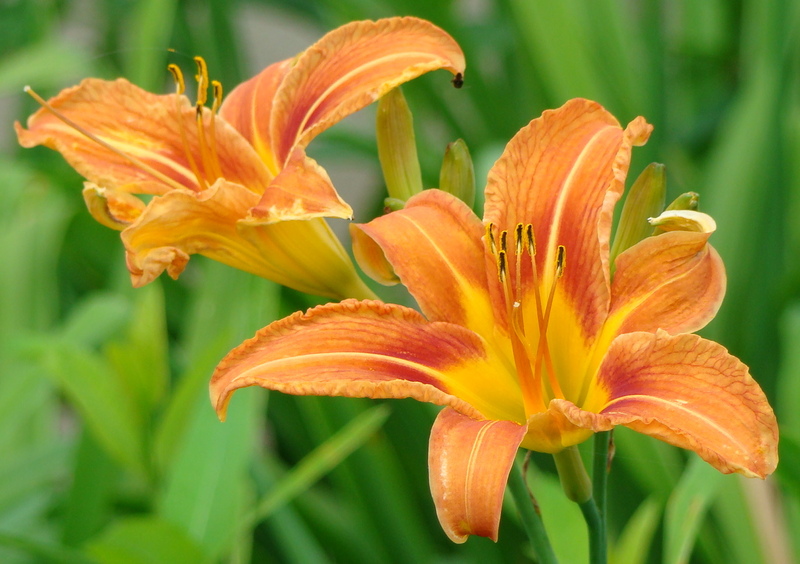 Every year when the Day lilies start blooming, you know its time to go to Conference. John Wesley called these meetings a “means of grace.” I think he was on to something. A pastor, husband, father, a sinner saved by grace. This entry was posted in Uncategorized and tagged Annual Conference, appointments, Church, civil war, day lilies, East Tennessee, Lake Junaluska, license, means of grace, Methodist, ministry, North Carolina, ordination, preacher, preaching, singing, Southwest Virginia, union confederate, United Methodist. Bookmark the permalink. Appalachian Values: Don't Get Above Your "Raisin'"